A title like Ponkidoodle grabs you right away, doesn't it? Turns out Ponkidoodle is that creature everyone's home has - the one responsible for strange noises and things that go bump in the night. Written by Neridah McMullin, and illustrated by Aaron Pocock, this picture book was published by Little Steps Publishing, 2009. Lots of kids feel afraid to go to sleep, or have the light turned out. Books like this one try to help kids cope with those fears. 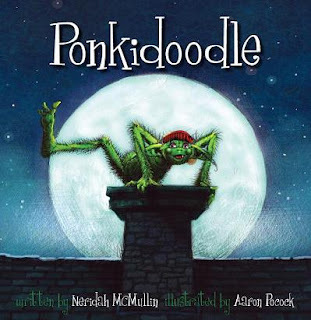 I love McMullin's idea of creating an imaginary friend called Ponkidoodle to explain scary happenings, and reassuring kids as to his personality. Giving me a huge fright. Aaron Pocock immediately backs up the fear implicit in those questions with his illustration of a youngster with huge eyes and trembling lips. But before we can become too involved in that night time terror, we meet the one responsible for it - and it's just Ponkidoodle! McMullin and Pocock's delightfully quirky creature might make peculiar noises but he's cute, furry, green, and very loveable. McMullin uses rhyming text and humour to engage young listeners. They will enjoy predicting what Ponkidoodle gets up to next, and I am sure will want to design their own cute creatures after reading all about him. I must admit I am now wondering if Ponkidoodle is the one responsible for all those odd socks chez Chook? This is an excellent quality picture book which will make a fine addition to a home, school or local library. There are great learning activities centered around Ponkidoodle available on Neridah McMullin's website, where you can also find out more about her books. And discover more on Aaron Pocock and his illustrations at his website, a truly magical place! http://bit.ly/9baHlr Latest post: Book Review, Ponkidoodl<wbr></wbr>e. Kids with night terrors may be relieved to read about this little green guy. Why thank you, JDaniel4's Mom! I wonder whether all your chooky odd socks might find pairs chez nous? It's a mystery, Jeanne, although I suspect my haphazard approach to laundry might have something to do with it. Isn't Ponkidoodle a cute name! Interest for me, in children's books, arose after dreading reading badly written books to my children. They would bring me a book and I would think OH NO! I started to investigate the book I LOVED to read the the children and they LOVED hearing. The best of boths worlds. I'm headed to the library tomorrow to hunt this one down. What a fun story idea! This sounds adorable, but once again, we're out of luck on this side of the pond. Daggummit. With all that technology offers, I can't believe we don't have better book-export/import options. I know what you're saying, Kelly. Some writing just flows so beautifully. The only way I used to get through the "not quite" books was to focus on the ideas and not the words. Thanks for the review, this book sounds like it deals with the issue of night time fear well. Look forward to reading it. I think you'll enjoy it, Planning Queen.